Lord Ganesha is prayed for health , wealth and happiness. Puja of Ganesha is done in many forms like Shvetark Ganpati, Ganesha Yantra , Ganesh Idols made Parad, Ashtdhatu, Brass. 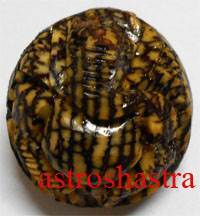 Beetal is considered as an auspicious things while doing puja , therefore Ganesha carved on Beetal nut is also considered very auspicious in Puja. Every puja altar shall have this and every puja is not complete without Lord Ganesha. 1. It is very auspicous in puja. 3. It removes obstacles in life. 4. Must for any puja ghar.